Knowledge is power, and nobody knows that better than the Analyst. With a clear head and cold logic, he turns figures and information into knowledge as deadly as blaster bolts. 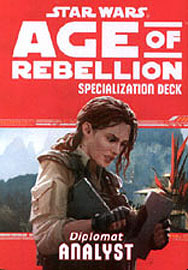 This deck requires Desperate Allies and includes cards for all 20 talents available in the Analyst specialisation.